Plants perennial; cespitose, without rhizomes or stolons. Culms (10)30-60 cm, erect, unbranched. 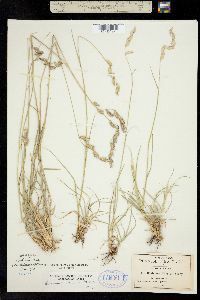 Leaves mostly basal; sheaths mostly glabrous, margins often long-ciliate distally; ligules 0.3-0.6 mm, of hairs; blades 1-10 cm long, 1-2.5(3) mm wide, flat, glaucous, bases with papillose-based hairs on the margins, similar hairs sometimes present on either or both surfaces. 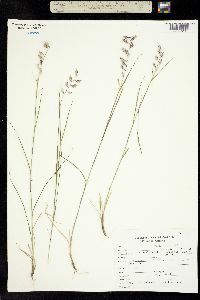 Panicles 2.5-6 cm, with 3-8(10) branches; branches (8)10-15 mm, densely pubescent, with 8-12 spikelets, axes extending to 5 mm beyond the base of the terminal spikelets, apices entire; disarticulation at the base of the branches. 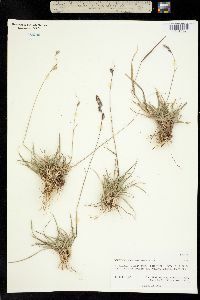 Spikelets appressed, all alike, 7-7.5 mm, with 1 bisexual and 1 rudimentary floret. Glumes evidently hairy; lower glumes 2.5-4.5 mm; upper glumes 4.5-6.5 mm; lowest lemmas 4.7-6.2 mm, hairy distally, 3-lobed, lobes unawned or shortly awned; lowest paleas 5-7.2 mm, pubescent along the veins and on the margins, bifid, veins excurrent as short awns; anthers 2.8-4 mm, yellow; upper florets rudimentary, glabrous, 3-awned, awns scabrous, sometimes arising from a short but evident awn column, central awns sometimes with a membranous margin, awns scabrous. Caryopses about 2.5 mm long, about 0.9 mm wide. 2n = 20, 22, 40. Bouteloua chondrosoides grows on dry, rocky slopes and grassy plateaus at 200-2500 m. Its range extends from southern Arizona and western Texas to Costa Rica. 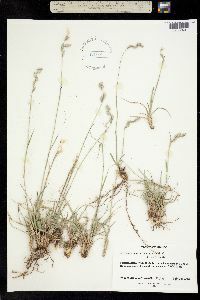 It resembles B. eludens in having pubescent panicle branches, but B. eludens usually has 12-16 branches 5-11 mm long with 2-6 spikelets whereas B. chrondrosoides usually has 3-8 branches 10-15 mm long with 8-12 spikelets per branch.